As many of the world's most influential people - from the world of spies, commerce, politics and finance - meet in Germany this week, Sputnik takes a look at a few of the world's most mysterious organizations. The annual meeting of the great and the good at which no minutes are taken and no reporting is allowed is being attended by former US Secretary of State Henry Kissinger, ex-CIA Director David H. Petraeus, former Supreme Allied Commander Europe Philip M. Breedlove, ex-British MI6 chief John Sawers and IMF boss Christine Lagarde at the 64th Bilderberg meeting, which is set to take place from June 9-12, 2016 at the Taschenbergpalais Hotel in Dresden, Germany. The all-male, mainly US club meets every July at Bohemian Grove, an elite campsite in California where ex-presidents, media executives, artists, musicians and prominent businessmen meet to discuss… well… er… stuff! With the motto "Weaving Spiders Come Not Here" members are overseen by an annual "captain" in a venue which includes a huge amphitheater containing the largest pipe organ in the world. The patron is John of Nepomuk, who was drowned in the Vltava river at the behest of Wenceslaus, King of the Romans and King of Bohemia. World's Secret Shadow Government: Conspiracy Theory or Frighteningly Real? The US membership club consists of over 4,900 members comprising top government officials, renowned scholars, business executives, acclaimed journalists, prominent lawyers, and distinguished nonprofit professionals, according to its own website. The Inter Press Service News Agency described it as "the nation's most influential foreign-policy think tank," while the conservative John Birch Society claims that it is "guilty of conspiring with others to build a one world government." Formed by David Rockefeller in 1973 and meeting in Washington, Paris and Tokyo, the think tank comprises people from the political, business, and academic worlds — but not current high office holders. Keep in mind that the original stated goal of The Trilateral Commission was to create "a new international economic order". Its central aim is to "foster closer cooperation among these core industrialized areas of the world with shared leadership responsibilities in the wider international system." "a skillful, coordinated effort to seize control and consolidate the four centers of power: political, monetary, intellectual, and ecclesiastical… [in] the creation of a worldwide economic power superior to the political governments of the nation-states involved." A powerful Washington lobby group that nobody knows who it represents and which does not have a website or file any accounts, according to the Intercept. It operates out of law firm Sutherland Asbill & Brennan and lobbies "on behalf of the Commercial Energy Working Group," and is variously described as "a diverse group of commercial firms in the energy industry" or "some of the largest users of energy derivatives in the United States and globally," but nobody really knows who they are. 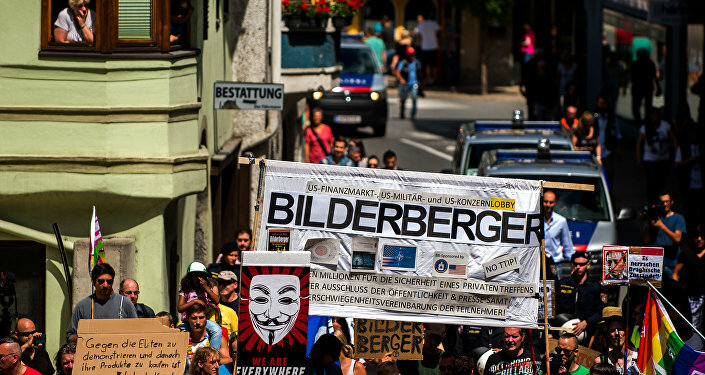 Bilderberg conference – a meeting of true decision makers?